Overview - What is the National Shabbaton? 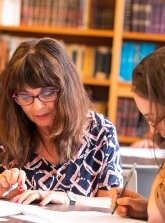 LEARN with Hadar faculty, including: Rabbi Shai Held, Rabbi Avi Killip, Rabbi Ethan Tucker, Rabbi Avital Hochstein, Rabbi Elie Kaunfer, Dena Weiss, Rabbi Jason Rubenstein, Rabbi Aviva Richman, Joey Weisenberg, and Rabbi Naama Levitz Applbaum. SING and PRAY with Joey Weisenberg, Director of Hadar’s Center for Communal Jewish Music. CONNECT with an incredible network of Jews, working together to build bolder, more ambitious, and more meaningful Jewish lives. The program begins on Friday with Minhah and Kabbalat Shabbat/Arvit and concludes on Sunday around noon. Check-in will begin on Friday at 3pm. If you arrive earlier, a storage room will be available for your belongings. The hotel is accessible by New Jersey Transit from New York City’s Port Authority Bus Terminal. The hotel offers free parking to all its guests. Directions from major airports can be found on the hotel website. *There are special rates and travel stipends available (on the registration form) for alumni of Hadar fellowship programs. What is the cancellation policy for registration at the National Shabbaton? Before February 4, 100% refunds are available. Between February 4 - February 18, 50% refunds are available. After February 18, we are sorry but we cannot refund payments. Please note that refunds may take up to two weeks to process. We appreciate your patience. We are so excited to be spending Shabbat together as an extended community. For those who have been to the Alumni Conference or other Hadar programming on Shabbat in the past, you know what to expect: energetic and moving tefillot, a relaxed, sacred atmosphere of learning and the opportunity to connect with people face to face. For those joining us for the first time on Shabbat, thank you for being a part of creating this special atmosphere with us! Our Shabbat space follows traditional observance and is most notably free of any electronic devices, including those used for communication. [Health professionals needing to communicate with patients should of course tend to those needs, ideally in a private space.] And while our Shabbat time will be free of musical instruments, we break those out on Saturday night! The hotel where we will be staying uses magnetic locks on the doors to the rooms. Some will feel comfortable, based on recent rabbinic rulings, to use these keys to enter the rooms on their own on Shabbat. But the hotel will also have staff available to assist guests to enter their rooms so that they do not need to use such keys themselves if they prefer not to. Staff will also assist with use of elevators for those who are unable to use the stairs. The hotel is not within the Teaneck Eruv, but all of our activities throughout the weekend will take place within the confines of the hotel. If you have any questions about Hadar's approach to Shabbat, you can be in touch with Rabbi Ethan Tucker at tucker@mechonhadar.org. There will be robust children’s programming throughout the weekend. We look forward to welcoming families with children of all ages. For children ages 0-3, babysitting will be available as noted on the schedule. Our programming for children 4 and up will be provided by Camp Ramah in the Berkshires and Ramah Day Camp in Nyack, two of the premiere Jewish summer camps serving the New York and New Jersey Jewish communities. The program will be lead by the stellar staff of the two camps. We hope you will take advantage of the exciting offerings the Ramah staff has planned! To bring a group from your community or organization, including group rate opportunities, contact killip@mechonhadar.org. Where is the National Shabbaton? The National Shabbaton will be held at the Teaneck Marriott at Glenpointe (100 Frank W Burr Blvd, Teaneck, NJ 07666). The hotel is accessible by bus from New York City’s Port Authority Bus Terminal. Buy a ticket for Bus 167, either to Teaneck or Zone 3; a round-trip ticket costs around $9. The hotel is visible as you arrive at the Teaneck - Glenpointe (Frank W. Burr) stop; look for a large black building with a red Marriott logo. If you are driving, free parking is available for all hotel guests. Directions from major airports can be found on the hotel website. Jews from varied backgrounds, committed to enriching their lives through a robust engagement with our shared tradition. There will be adults, kids, students, retirees, young professionals, and families in attendance; long-time Hadar community members, first-timers, and YOU. Please contact R. Avi Killip (killip@mechonhadar.org) or Andrew Belinfante (10years@mechonhadar.org) with any questions we haven't answered here. There will be two people assigned to each hotel room, unless they choose to pay extra for a private room (+$139). For those paying the student rate, there will be three people assigned to each hotel room; the hotel will provide a cot, so that each person has their own bed. Rooming is generally done by gender; spouses are housed together. If you have any special needs or concerns in this regard, please be in touch with us at 10year@mechonhadar.org. Questions about rooming with children? See our section on children below! Yes! Preferences can be indicated when registering. We will do our best to honor all requests. What if I live close by and want to attend but not sleep at the hotel? Can I receive a discount? If you would like to attend but not sleep at the hotel, your cost for the weekend will be the same as regular registration. Rooms are already provided at a heavily subsidized rate and comprise a small portion of the cost of attendance. Please fill out the form as usual and let us know if you will not be using your room. The cost of registration includes all meals, beginning with dinner on Friday and ending with breakfast on Sunday. We are excited to partner with Silverleaf Caterers for the weekend to provide all meals. More information about Silverleaf can be found on their website here. They are under the strict supervision of the Vaad of Riverdale. If you have questions regarding kashrut, please contact Rabbi Ethan Tucker (tucker@mechonhadar.org). We will do our best to accommodate all food allergies and dietary restrictions. Please indicate your needs in the appropriate section of the form when you register. If you forgot to list your food allergies and dietary restrictions, please contact us (10year@mechonhadar.org) as soon as possible. Will there be children’s programming? There will be age-appropriate children’s programming throughout the Shabbaton. More information to come! Are there cribs available for small children? The hotel has a limited number of cribs, which will be provided on a first come, first served basis. If you are able to bring your own, we encourage you to do so. Most of the rooms will have two double beds, so that parents and children can sleep in the same room. An additional cot can be provided for those who need it. If you would like to add an additional room to accommodate your entire family as part of your registration, that option will be available to you on the registration form. Please contact us at 10years@mechonhadar.org with any further questions. What will prayer (davening) be like at the Shabbaton? People come to events at Hadar from a range of communities and personal prayer practices. Our goals are 1) to maintain sufficient uniformity so that we can create a unified davening community, 2) to make liturgical choices in keeping with the halakhic discourse surrounding the language of prayer, 3) to be true to our theology and values, and 4) to honor the differing practices and approaches of members of our community. As you can imagine, it is sometimes tricky to strike this balance. We hope that you can find meaning participating in communal davening throughout the weekend, both in moments of familiarity and when encountering something new. Is the venue within an eruv? No, the hotel is not within the Teaneck Eruv. All activities throughout the weekend will take place inside the venue. What should I wear over the weekend? On Shabbat? Everyone is welcome to come as they are to the Shabbaton, and there is no enforced dress code of any kind. The entire Shabbaton constitutes a holy atmosphere; we will be learning Torah, sharing meals, and praying together throughout the Shabbaton, so if your custom is to wear a kippah or other head-covering in sacred spaces, we encourage you to do so over the weekend. While the Shabbaton is relaxed and casual, you are encouraged to dress up a bit on Shabbat itself in order to reflect and participate in the special nature of the day. If you have any further questions about clothing, please reach out to Dena Weiss (weiss@mechonhadar.org). Are there gender neutral/family restrooms at the venue? Unfortunately, all public restrooms at the hotel are separated by gender. If you wish to use or require a gender neutral/family restroom, your room is the best option. This was not our preference, however we were not able to find an appropriate venue with gender neutral restrooms. We apologize in advance for the inconvenience. Is the venue accessible for people with limited mobility? Yes, the venue is fully accessible for individuals with limited mobility. For those who need to use the elevator on Shabbat, hotel staff will be on hand to operate it.